August 25: Happy Birthday, Althea Gibson! Happy birthday to Althea Gibson, the first African American to compete on the world tennis tour. Called “the Jackie Robinson of tennis” for breaking the color barrier in her respective athletic arena, Gibson is the first African American woman to win a Grand Slam title, as well as the first to be ranked no. 1 in the world. She was inducted into the International Tennis Hall of Fame in 1972. Olympic and World Cup Soccer Champion, Brandi Chastain, shares her inspirations and advice for young women. Also, check out this interview of players Mia Hamm, Julie Foudy & Brandi Chastain on women and sports. Five high school athletes have died in the past week from a heat-related illness after being physically active in the heat. As temperatures rise, it is critical that athletes of all ages follow some basic steps to stay safe in the heat! Water is key! Your urine should be a light to clear color (like lemonade). You are probably dehydrated if it is dark yellow (like apple juice). Being dehydrated can increase your risk for becoming too hot and may impair your performance. Replacing electrolytes through sports drinks, such as Gatorade and Powerade, is smart if you are exercising for a long time. Early or late in the day is better when temperatures are lower. Don’t expect to break your personal records in the heat. If possible, choose to exercise in the shade or indoors when it is really hot out. Acclimatize yourself to exercising in the heat. If you know you’ll be playing a tournament or if you are beginning practices for a fall sport over the hot summer months start gradually working out in the heat. Keep your workouts short and make sure you have plenty of access to water. Give yourself at least a week to get used to the heat but always still listen to your body! IF YOU ARE NOT FEELING WELL WHILE EXERCISING IN THE HEAT, STOP!! Carry an insulated lunch pail with a face cloth, soaked in water and then frozen. (a tip from Yale ’84 soccer player Susan Diaz Killenberg) You can wrap this around your neck, drape over your head or back, or cool your face with it. Wear wicking garments that help your stay cool. Wear light colors because they reflect, rather than absorb light. Bring and extra pair of soccer socks and slips so you can change them between games. Confusion or disorientation – this is a dangerous symptom of heat illness because people may not realize they have a problem! Other signs or symptoms: cramps, nausea, thirst, dizziness, headache, irritability, vomiting, fatigue. Body temperature over 104°F. Don’t trust an oral temperature reading – it may underestimate. If you suspect heat stroke, putting the person in cold water or aggressively putting cold water over them is the quickest and safest way to lower body temperature. This treatment leads to a 100% survival rate when performed early. After cooling, transport the individual to the nearest medical facility immediately. August 2: Happy Birthday, Skylar Diggins! Happy birthday to Skylar Diggins, star of Notre Dame’s Fighting Irish basketball team. As a sophomore, the guard led her team to the 2011 NCAA championship game, where they lost to Texas A&M. 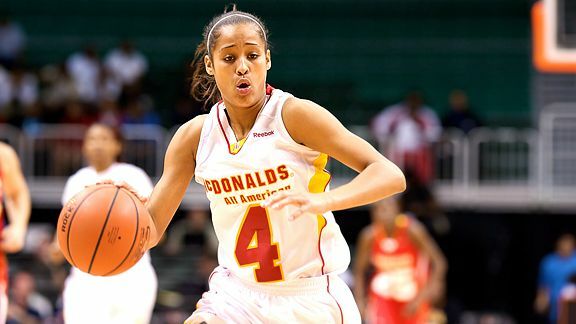 However, Diggins’ efforts did not go unnoticed; she was named a 2011 All-American by the Associated Press and a finalist for the Nancy Lieberman Award. She was also selected as a member of the 2011 State Farm Coaches All-Star Team. June 26: Happy Belated Birthday, Babe Didrikson Zaharias! Happy belated birthday to Babe Didrikson Zaharias, named the 9th Greatest Athlete of the 20th Century by the Associated Press and the 10th Greatest North American Athlete of the 20th Century by ESPN. Didrikson Zaharias excelled at a variety of events, especially those within the areas of track and field, basketball, and golf. Inducted into the World Golf Hall of Fame in 1951, the Texan native won 41 LPGA tours, including 10 major championships. She has also won three Olympic medals- two gold medals, in the javelin throw and 80m hurdles, and a silver in the high jump. In terms of basketball, Didrikson Zaharias gained All-American status and played for the Amateur Athletic Union. She is considered a Renaissance woman due to her versatility and success across a wide range of athletic events. The most popular professional sports in America, in the world, even, are dominated by men- think football, baseball, basketball, soccer, and, though an increasingly large number of females are playing sports, women’s professional leagues still suffer from lack of interest. This is in part because our society has long been adamant that sports are only for men but also because the legacy and culture of men’s sports are passed down from father to son. As a brand devoted to helping develop women’s sports and girls’ interest in sports, Dragonwing girlgear® believes it is crucial for girls to learn about female athletes who have conquered in order to see them as role models. Boys, and girls, who don’t play baseball are well aware of Babe Ruth’s story. What about the other Babe? Not that many young female golfers, basketball players, or runners learn about Babe Didrikson Zaharias, the athlete extraordinaire who excelled at all of those sports. This trend we’re seeing, of female athletes remaining obscure and girls remaining deprived of female role models in the sports arena, must end if women are to achieve equality in the world of athletics. If the stories of strong, successful female soccer players, figure skaters, runners, and gymnasts aren’t told, their successes will be lost to this generation of girls. Girls should grow up with the belief that they too can become a part of sports history and that there is a spot for them in the world of sports. To understand this, though, the tales of successful female athletes need to be shared. In order to rectify this social pattern and to raise awareness of successful female athletes, Sideline Chatter is going to be featuring such legends on their birthdays, celebrating the players who have established women’s place in the world of sports.